The last several years have seen the LGBTQ community making strides in society, yet outside Toronto you see little evidence of that progress. Recently the City of Mississauga and the Peel District School Board changed that. Students and staff from Peel Alternative School South, along with staff from the City of Mississauga and community members, just unveiled the first-ever piece of LGBTQ+ art for public space in Mississauga, located across the road from the Port Credit Lighthouse. 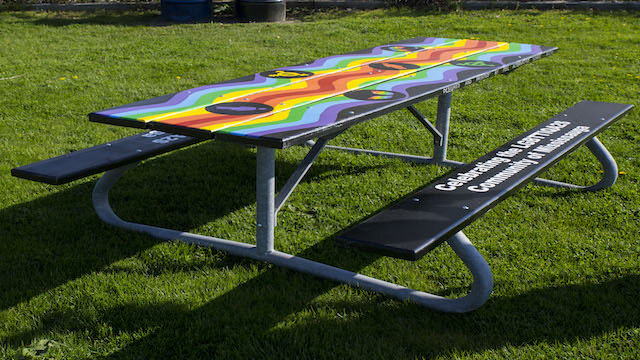 The project was initiated by the LGBTQ+ community, along with late Ward 1 Councillor Jim Tovey. Tovey died suddenly in January at the age of 68. The artwork was unveiled Monday, May 14, at 11 a.m. It is across the road from the Port Credit Lighthouse at the northeast corner of Front Street North and Lakeshore Road West in Mississauga. Students, staff, delegates from the Peel board, City of Mississauga representatives and community members were on hand for the ceremony. The project was completed under Mississauga’s Beautification Program which aims to enhance public spaces in neighbourhoods and streets around Mississauga.